Your child’s hair grows at an average rate of approximately one quarter to one half an inch every month, with a yearly average of approximately five to six inches. While it’s difficult to speed that up, you can take a variety of steps to help your child’s hair stay healthy, reach its maximum thickness and avoid breakage so her hair growth will stay on track. Shampoo your child's hair with a mild cleansing shampoo, and, if she is not prone to oily hair, shampoo only once or twice a week to avoid over-drying. Use a conditioner that contains effective moisturizing ingredients, such as jojoba oil, hydrolyzed wheat protein and fatty alcohols. Glycerin also helps by drawing moisture from the air to the hair. Brush out your child’s hair while the conditioner is still in her hair or use a detangling solution if she is prone to knots. You can make your own inexpensive detangler at home. Just fill a spray bottle approximately three-quarters full of distilled water and a spoonful or two of her conditioner. Mist your child's hair with the mixture and allow it to saturate for two to three minutes before brushing out her hair. 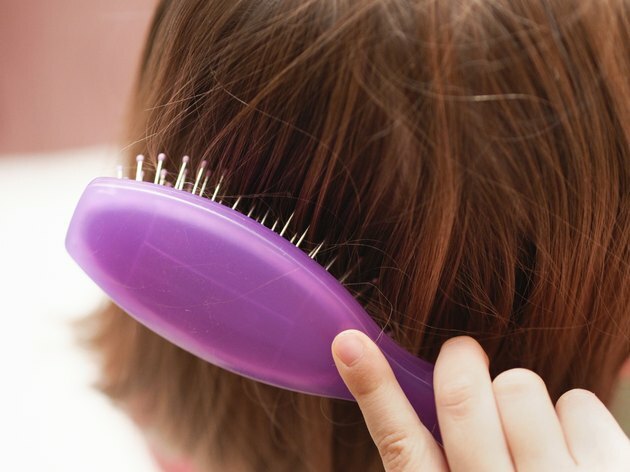 Brush your child’s hair with a cellulose acetate brushing comb or a boar bristle brush. The cellulose acetate combs won't cause static, and the boar bristle brush will distribute the natural oil on your child's scalp throughout her hair. Both of these will glide more gently through her hair than a synthetic plastic brush, which will often snag on the hair. Avoid heat styling tools, such as hair dryers, curling irons, straighteners and crimpers. These will all work to dry out the hair, making breakage more likely and causing your child's hair to look dull and lifeless after frequent use. Style your child's hair with snag-free accessories. Look for hair elastics that are covered with satin or another smooth fabric and never use rubber bands in place of hair elastics. If you braid her hair, ensure the braids are not too tight because the resulting tugging can cause hair breakage. Maintain an adequate, well-balanced diet for your child. This will help ensure she is receiving vitamins, such as antioxidizing vitamins C and E, which protect the hair from sun and environmental damage, and the B vitamins, which promote healthy hair growth and damage repair. Ensure her diet includes her daily recommended iron intake -- between 7 and 10 milligrams per day for children, depending on age -- because the mineral helps to defend against hair thinning and loss. Essential fatty acids will also help maximize her hair health, avoiding hair loss and promoting growth. Coloring a child's hair can lead to hair loss, in addition to allergic reactions and a burning sensation on her scalp.